We highly recommend NuVet to all of our Unique Doberman customers. DUE TO THE RECENT FDA INVESTIGATION INTO TAURINE DEFICIENT DOG FOOD CAUSING DCM WE NOW RECOMMEND THE FELINE CAT POWDER ON OUR DOBERMANS BREAKFAST AND THE CANINE DOG WAFER AT DINNER. NuVet prevents and reduces the risk of Heart Disease, Liver Disease, Eye Tearing, Diabetes, Premature Aging, Cataracts, Tumors, Arthritis, Joint Problems. Improves Lethargy, Allergies, Skin and Coat Problems, Dry Flaky Skin, Scratching, Itching, Biting, Sperm Count in Males, fertility in females and More! · Promotes proper function of the immune system, cardiovascular system, bones, nerves and glands. · Protects against dangerous environmental toxins your Doberman will encounter daily. · Helps keep your Dobermans skin and coat beautiful and shiny with natural omega fatty acids. Is Your Doberman Suffering? NuVet Can Help! Get Your Doberman Healthy- Keep Your Doberman Healthy! NuJoint Plus: Protect. Strengthen. Heal. · A preventative measure to help reduce the risk of osteoarthritis and cartilage deterioration in your Doberman. 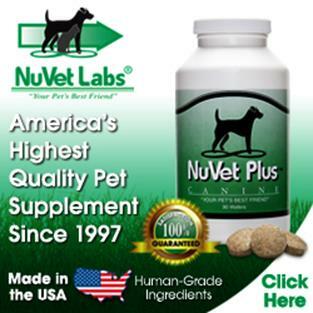 NuVet is not available in stores or directly to the general public. 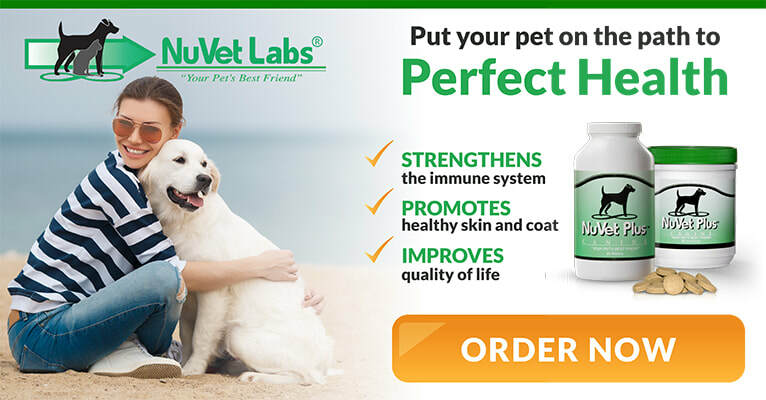 ​You can only purchase NuVet Plus and NuJoint Plus when you get a recommendation from a pet professional. Thousands of the nation’s top veterinarians and other pet industry professionals use NuVet Plus® and NuJoint Plus® for their own pets and recommend it to their clients’ pets! Saving JUST ONE major trip to the vet could pay for more than a lifetime supply of NuVet supplements! 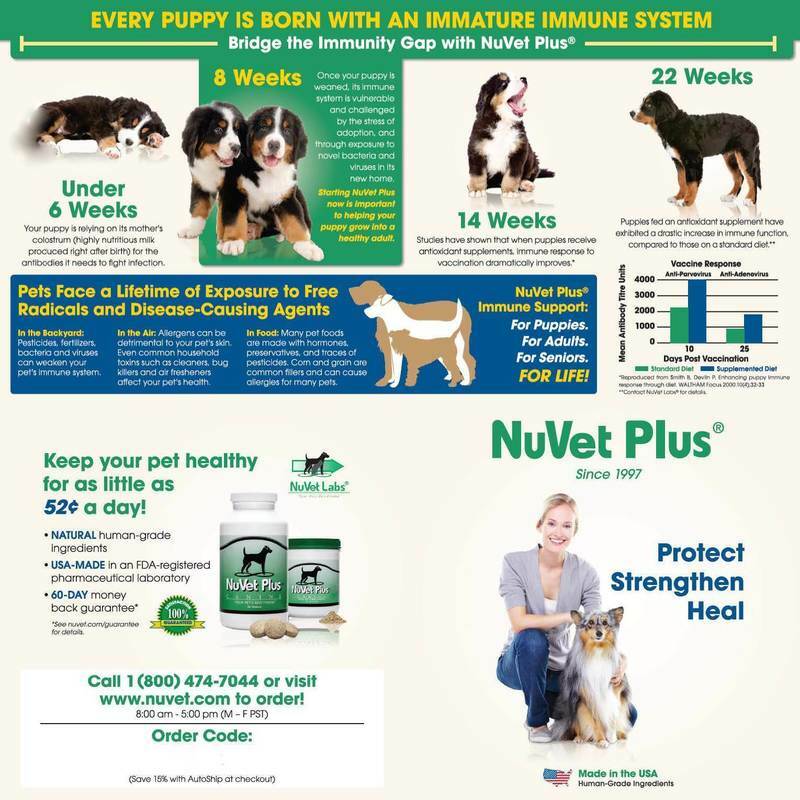 The AutoShip program allows you to receive a 15% discount on NuVet Plus® and a 10% discount on NuJoint Plus®. 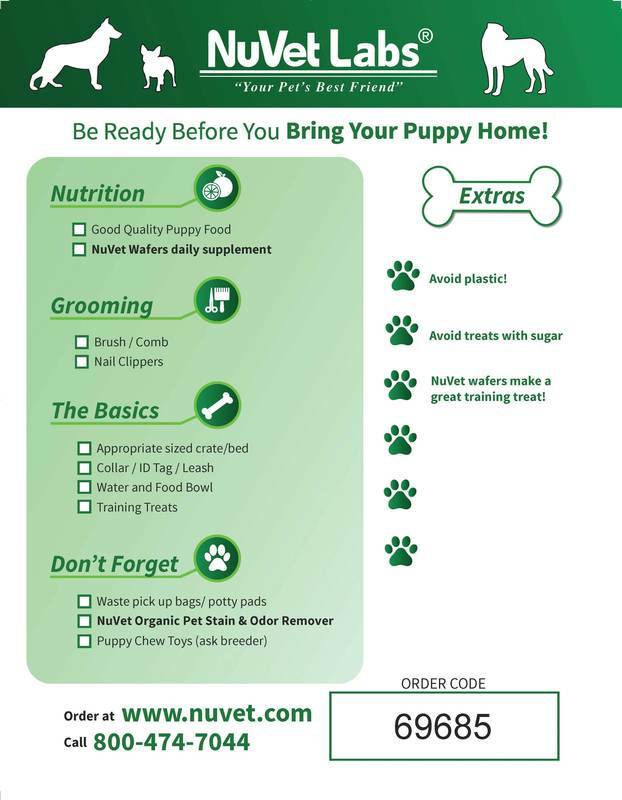 AutoShip is an automatic refill of your NuVet Labs® supplements; the shipping frequency is calculated according to the number of pets you have and how many supplements they each receive per day. You will continue to receive the discount for as long as you stay on the program, and you may cancel at any time, for any reason,with no cancellation fees or penalties. Nuvet Joint Plus to keep your Doberman in top condition. Unique Dobermans also recommends certain Wysong dog food to keep your new Doberman healthy and strong. Every Doberman puppy for sale at Unique Dobermans has been thoughtfully and carefully planned and considered long before the breeding has taken place. Your new Unique Doberman puppy (if you are so lucky to be chosen as one of our elite Doberman puppy owners) comes with a pedigree sporting German and European Dobermanns full of world champion show dogs plus each one has been worked to at least a BH in Schutzhund, IPO, Personal Protection sports and competitions. What do all of these Doberman working titles and Doberman show titles actually mean to you as a "pet owner" that doesn't plan on showing your Doberman puppy? EVERYTHING! Your new Doberman Puppy's parents have passed strict temperament testing, tracking trials and personal protection courage testing of their character. The genetics behind your Unique Doberman puppy shows that his genes are free of hip dysplasia, eye diseases, bad temperament and poor conformation. 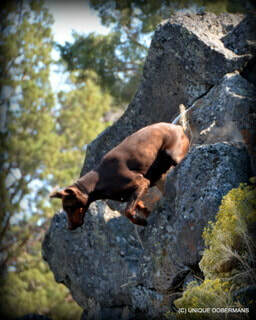 A Doberman dog that cannot hold up to the extreme athleticism that is required to obtain working titles is a poorly conformed dog and will break down, a Doberman dog that will not readily willing to obediently obey and have a strong desire to please it's master is not a pleasant Doberman to live with inside the home and certainly will never be able to obtain these titles.